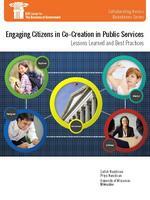 The authors present four roles that citizens can play in the co-creation of public services. Professors Nambisan and Nambisan present an innovative framework from which to view citizen “co-creation,” which refers to the development of new public services by citizens in partnership with governments. The authors present four roles that citizens can play in the co-creation of public services: explorer, ideator, designer, and diffuser, with examples of citizens playing each of these roles. This report continues the IBM Center’s interest in the concept of public service co-creation and co-delivery. The report, Beyond Citizen Engagement: Involving the Public in Co-Delivering Government Services, by P.K. Kannan and Ai-Mei Chang, provided a guide for introducing and implementing a co-delivery initiative. Taken together, these two reports are on the forefront of increased insight into how governments can improve services through co-creation and co-delivery. In their report, Professors Nambisan and Nambisan note that numerous forces are redefining citizen roles in the public sphere, “a shift from that of a passive service beneficiary to that of an active, informed partner or co-creator in public service innovation and problem-solving.“ The authors offer four strategies for government leaders who wish to encourage citizen co-creation. In addition to the Kannan and Chang report, the IBM Center has also sponsored a series of other reports that address specific approaches to co-creation and co-delivery. Two (Challenge.gov: Using Competition and Awards to Spur Innovation and Managing Innovation Prizes in Government) address how thefederal government is using competitions to engage citizens in the development of new ideas and new products. A third, Federal Ideation Programs: Challenges and Best Practices, discusses how the federal government can tap creative thinking from across the citizenry to come up with new approaches to solving problems. A fourth report, Using Crowdsourcing in Government, discusses how the federal government can leverage groups to build ideas into actionable strategy through increased citizen engagement.